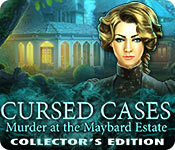 Cursed Cases: Murder at the Maybard Estate Collector's Edition is rated 3.5 out of 5 by 35. Rated 4 out of 5 by ninja226 from could have been more challenging--CE review I played this in advanced mode. It's not a very difficult game to play. All the elements are good (music, graphics, storyline, puzzles), but not outstanding. I bought the CE version based on a review saying it was "long", but it wasn't challenging enough to be long and the bonus chapter started out promising but ended way too soon, like they ran out of steam a 3rd of the way through. Yes, it was enjoyable, but buy when on sale. I did not find it a great CE value. Rated 4 out of 5 by Italia47 from Please, don't tell me it was the butler that did it! Based upon the demo--had 49 minutes to go--I knew that this would be buy for me. I'm rating it 4.50 stars. I think there is so much potential for this game as it's rather different from other games I've played recently. I would have probably preferred the SE version but no matter--this is a very good game, I think. My only gripe is why a physic, which I'm not interested in and she seems to be more of an investigator as far as I could tell. Anyway, you will be using her Aura magnifying glass for certain clues that pretty much an investigator cold easily find. Go figure! With that said, my other gripe is why isn't there a voiceover for this so-called detective-physic? I also assumed the gentleman who was killed was British. I could be wrong, though--but that's no big deal, but there should be some consistency here. The graphics were lovely but cartoonish in a way; and the movement of the characters was much like puppets without strings. The characters spoke too slow for my taste as I'd rather read the script and just move on. The voiceovers for the better part were very good. Loved the butler's British accent! I like the puzzles and hops and the variety that you have in this game. A nice mix, to say the least. You can also opt for a Match 3 game instead of playing the HOP. There are collectibles, too. Yayyy! Love the ambiance in this game as well. The sound quality is nice--unobtrusive. Great transporter map, lots of great clues; good hint button, guide, the works! Very nice, devs! A locked inventory box--prefer a transparent one but this will do. If you want to know the storyline, I could easily cut and paste Big Fishes' synopsis for you or make notes along the way. Trust me, the game has great potential regardless of the flaws that I have mentioned, and I can put up with these types of flaws in any given game. Very rarely have I found a game to be 100% flawless--possibly five in my whole gaming career. Again, I always review the negative reviewers' comments first because it's truly cut and dry with them. They bring out the points that I may have overlooked at times. But in either case, this game definitely clicks for me and I couldn't pass this up if I tried. I like the flow; the strategy and organization of the tasks. Very thought-provoking activities. Love it. I definitely recommend it. Rated 4 out of 5 by Phoebecat1 from Solid Game So much about this game is good. I'm over halfway finished with it and wanted to give the developers high marks for coming up with an interesting story line, as opposed to the usual fairies, princesses, and goblins that I have stopped buying. I know if I'm sick of playing them, developers have to be sick of making them. Visuals are attractive, scenes are detailed and I really like the match 3 option. One peeve that I wish ALL developers would do away with is the sparkle hints on match 3. If you can't find three matches, you're blind, so it's a waste of time to even put it in and in this game, if you don't find one within a couple of seconds, they show you. STOP IT. It's irritating. I think I can find 3 matching hats or pipes or what have you. Also, they are too easy. The search for things in this game is fairly easy too. Challenge of puzzle is fairly low, but there is some variety in kind, which I like/ Overall, solid B game. Good. job. Rated 4 out of 5 by Dianamarieg81 from Diamond in the Ruff I was pleasantly surprised about this game. First off when you start the game it gives you an option of playing as a male or female. While you don't get to hear the voices of your character (which would have made it even better if they did both male and female voices for the main character's lines) your silhouette/hands are reflected as the gender that you choose. You play as a detective who can see the dead to help you solve crimes (and while this does sort of remind me of Angelica Weaver which is also another great game) it is slightly different. When you use your sixth sense it just helps you to get more info on the back story it's not real puzzles and after you go through the scene it is put in your journal which is really cool. It has a flow chart of all the characters and how they relate to victim and how they could be a possible murder suspect. You also collect finger prints to figure out who is the killer in the end. While they game was a little bit easy (I finish very quickly) I had a lot of fun. The extras range from wallpaper, bonus art, achievements, collectibles (which is from the morphing objects and then it puts the persons profile of the cast from the game into a diary and a gives you a little more back story on them) music, developer diary, match 3 and the bonus story (which was good but very short it was like you started in the third act of a movie it would have been better if they started in the beginning). The graphics were quite good along with the voice acting(as I stated before though your character doesn't speak at all) The hop's were a little to easy for me but I think that most are lately I guess because I play to many of these games. The puzzles where the same way for me as the hops. I really was playing more for the story to find out the killer. I will say the game is a bit violent there is a lot of blood shown on the screen especially in the bonus level (there is a scene where some one gets gutted) so if that is not for you then you might want to steer clear from this one. But for the most part is was really good I just would have like the game play a little harder. I would love to see the developers improve on the next one (hopefully our character speaks in that one and the puzzles and hops are a little harder) if they are going to continue the series. Rated 4 out of 5 by Newlka from Exciting who done it It's funny because I beta tested this game just 2 days ago and now it is already out. Probably I fell into the last group of testers before release. Although I gave good evaluation of the game when testing, I do agree with other reviewers that the game does not offer any extraordinary features you have not experienced before, if you are a regular HOPA player. However, puzzles are a challenge and of course graphics, visual and sound effects are outstanding. As I truly hate phantasy/fairy tale games, the story line was like fresh air to me, really adult stuff. Unfortunately there are not too many of this kind recently, so I really valued it. Sure, the wow effect is missing but still it is a nice decent game worth the buy. Rated 4 out of 5 by kadokakid from Maybard estate Story great, graphics excellent, game play somewhat clumsy. Rated 4 out of 5 by biscuitsmama from A MURDER AND A GAME FULL OF GIMMICKS Just like many others, I have been waiting for a good old-fashioned mystery but I am not sure about this one. As an investigator with special paranormal talents, you have been called to investigate the recent murder of Emmett Maybard. Not only was Emmett murdered but his sister has had an attempt on her life as well. Of course since it is a murder mystery it begins with blood spatter but fortunately it is mostly left to the imagination. As much as I love a good mystery game, IMHO, this game bogs down from the first moment when I had to use my special ability to search for clues. I absolutely hate this feature and when that was the first thing I had to do upon beginning the game, it was almost the last. Fortunately, I plodded onward and the game does become much better. The graphics are excellent except that some of the characters seem comical, particularly the butler who sort of hops rather than walks when he answers the door. Aside from that the graphics seem excellent and crisp. The voiceovers are also extremely good. The game also offers a custom mode where the hints and skips can be set for 1 second, which I am sure will appeal to many. You have an interactive map and then a gimmicky monocle to use that allows you to see auras. As I mentioned above, I hate this gimmick and almost didn’t continue in the game because I dislike it so much. Your other tool is an investigation kit that allows you to dust for fingerprints. The first mini-HOP is searching for obscure clues when arriving at the Maybard Estate and I hated that particular opening scene. The next HOP was silhouette that had almost unidentifiable renderings of the objects to find. The silhouette type HOPS are my least favorite unless they are well-crafted and this one was not. Fortunately the HOPS are varied in style and some are excellent. The mini-games are very good and although most are easy there are a few that offer more challenge. The CE version of the game is unremarkable with nothing much extra except for the replay of HOPS if you haven’t had enough of them by the time you finish the game. There are collectibles and the dreaded achievements but the remainder of the package is the standard fluff. 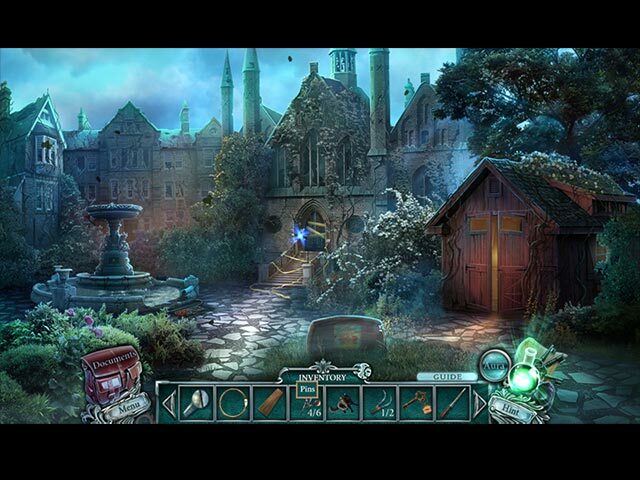 Cursed Cases Murder at the Maybard Estate is an excellent quality game that I am sure will appeal to many HOPA lovers but for me it felt tedious and rather boring. The use of the gimmicky monocle was an item that I believe bogged down the momentum of the game. Since I had a free game coupon I did get the game but it will probably sit in my GM until I have nothing else to play. Even though I didn’t care for the game I am sure many of you will love it and find that it is just the type of game you have been waiting to play. As always, I suggest you try the demo to see if this is a game you will like. Rated 4 out of 5 by pennmom36 from Welcome To The Deadly Maybard Estate! Emmett Maybard has been murdered and his killer is still on the loose! It's been two weeks since his murder and Emmett's sister Sophia has hired you to investigate because of your unique psychic ability to see past events and even people who have passed. The killer isn't done yet however, because one by one, he has been trying to poison Emmett's family and friends. Could the murders have anything to do with his current will? I'm on the fence with this new production, it clearly has potential but lacks a wow factor in my opinion. By the end of the demo, I found the tasks to be a bit dull and repetitious, leading me to believe that after the demo, the game could become stagnant and trite. The graphics are decent, the voiceovers are well done, but the people and animals move sideways and jilted, I'd rather they not show the movement at all rather than watch them move awkwardly and unrealistically. Because you are psychic, you will use your Aura ability frequently which requires you to find two or three "clues" by searching for evidence with a magnifying glass until you find an area with a shaded blue section. Each clue you find will explain your detective deduction, but I just found this feature kind of lame. Some items in your Inventory will have a question mark which indicates that the item is evidence, usually in need of forensics. Your forensic kit is basically an icon with powder and an icon with with tape so you can follow a two step process to lift the print, which is very basic and repetitious. This Collector's Edition has the usual Achievements to earn as well as 13 Morphing Objects that will shed light upon the characters with a short bio. There is a satchel located on the bottom left of the screen that contains all your important documents, an evidence board, a map, a task list, and notes about the case. You can also access the Character bios you have found, replay the game's videos and your Trophies for earned achievements. 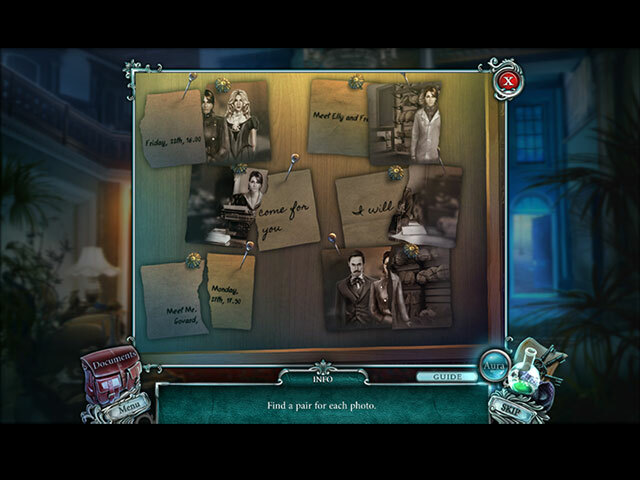 The Hidden Object Scenes are unimpressive, with no new variations, at least within the demo itself. Some of the scenes are repeated a second time which is a feature I hate because it's too boring a second time around. There are Silhouetted Shape finds,multi layered HOP's where you first find multiples of two different items and then place the objects into two ornate boxes which opens up the item Lists. There are smaller Zoom Zone puzzles and you can opt to play a Match 3 game instead of the HOP's. The Mini Games seem to be variations of the same type of puzzles. Below are brief descriptions of some of the games you'll encounter during the demo: 1) Recreate the image by placing diamond shaped tiles into the correct empty slots using directional arrows on each column and row of a grid board. 2) Each Aura ability requires you to search for blue shaded areas, usually two or three different areas of interest. 3) Restore the image by placing flower buttons to rotate the positions of the tiles. 4) Drag clock weights to set the time according to the clue shown. 5) Select pairs of matching items, beginning with 3 objects, then 4, then 5 items to climb a tree. (this made no sense, why would you grab onto a kite stuck in a tree or a finch minding it's own business to help you scale up a tree?) 6) Rotate the rings to line up with the silver clasps, clicking on one ring may affect others. 7) Jump the checkers, one by one to clear the board. 8) Drag groups of gears to their correct positions based upon the clue. 9) Place several portraits in their correct positions based upon their shapes using green gems to rotate. 10) Move gears correctly to open a lock. This Collector's Edition has 13 Developer Diary pictures, 10 Concept Art pictures, 6 Wallpapers, 13 Morphing Objects with character bios, 4 Music Soundtracks, 6 levels of replayable Match 3 games, 26 Achievement Trophies to earn, a built in Strategy Guide and a Bonus Chapter, enjoy! Rated 3 out of 5 by genenut from Not such a good time had First of all "Skip" goes at the top upper left hand corner. Next what is wrong with morphs and puzzle items. Most puzzles way to easy. Got real tired of that find three clues things. It didn't add one thing to the game. Gave it a three just because it might be fun for 5 year olds. Rated 3 out of 5 by Janetto from Had Potential I enjoy detective stories such as murder mysteries, etc., and thought this would be fun to play. It's rather slow moving with silly gimmicks such as an aura finder. I was unable to complete the Bonus Chapter due a glitch. Hidden Object Scenes are my favorite thing about Hidden Object Games -- not Puzzle Scenes so it would be nice if the developers would offer the Match 3 option for puzzles rather than HOS. This game had potential, but did not meet it. If this is going to be a series, I hope the developers make improvements. Rated 3 out of 5 by fiewi1 from Not really thrilling Nothing really exciting about this one. It's a bit sloppy, poor in the game design overall and the much disappointing factor; its short duration. Even the bonus game, that to me was more fun to play that the main... course, consisted of 3-4 scenes and that's it. Well, surely, that's not value for money, for one thing! Rated 3 out of 5 by luvmycats from too short, and the bonus game a joke! it was fun to play, however the graphics are not what you would expect from Daily Magic that has put out better graphics previously. the game is too short, and the bonus game is a very short joke. Rated 3 out of 5 by Torpedo1 from I Just Might Be Sleep Walking Not much different the the Regular version of this game, but still worth a play and I would buy it on sale. Love the touches of critter action. Good Characters, Plenty to do, Mix of HO's, Morphing objects, and not sure if there were any collectables. Fairly good game, but not my favorite. So 3 and half stars to be closer to my rating scale. Rated 3 out of 5 by lbtgam222 from Maybe as an SE I really didn't think this game was CE worthy. It's OK, I just played the demo and will not purchase. There isn't a lot here to make it worth the extra $$ other than the ability to play a Match 3 instead of the HOS a couple of sparse morphs and some really unexcitable achievements. I did like the map, story was OK and I liked the dog. I didn't really care for the achievements, one is to download a wallpaper and some you have to play in hard or custom to achieve. Overall, I thought it was lacking in a lot of ways. The games were super easy. Some I'm not sure why, but I got in three moves. The HOS were interesting, but nothing new. And looking for clues and fingerprints was simple and uninteresting. Defiantly won't be on my game of the year list. As always, play the demo and judge for yourself! Happy gaming! Rated 2 out of 5 by Granny_Gruff from Please, May I Have a Drink of Isabel's Water? You have been called to the Maybard estate by the murdered man's sister. Emmet Maybard was murdered and the attorney is coming to read his will. You arrive in time to get the door knocker ring from the dog and witness the murder of the murdered man's friend, Isabel, who has sipped some poisoned water. Luckily the doctor, who happens to be in the house, sends you to find his missing equipment. And then the attorney feels perfectly comfortable asking you, a lady detective, to climb a tree to break into the study of the murdered man to open his safe. Good stuff: All the usual game elements are present including HOPs with Match 3 alternative, mini-games, and a story line. Bad stuff: I don't know where to begin... How about a doctor that asks the detective to find his basic equipment? The guest who asks a stranger to find her a fan? The detective who opens a family member's package to get out a brand new fan for the guest? The attorney who asks a woman in full nineteenth century long skirts and lace gloves to climb a tree to break into the sealed off crime scene? Or should we start with the detective willing to climb a tree and break into the study for papers the attorney was unwilling to tell the police he needed out of the crime scene? Or we can weep over the "extra ability" of the detective that is a horrific addition to the game, clunky, and only partially working. And finally there are the mini-games, in which case, the less said, the better. Somewhere in there is the moment I threw up my hands and ran for the door - or in this case, the exit button on the main menu. I beta tested this turkey and begged them to fix it. I thought it had great potential. Now I just think it is DOA and needs to be buried in an unmarked grave! For heavens sake, try the demo before you buy. Rated 2 out of 5 by Tigerfire_62 from Totally Lame So boring from the start! Don't waste your money! Rated 2 out of 5 by p2668 from Not for me... Gave this game a try, and after the second time of using the aura thingy to find clues, I quit and uninstalled it. I really dislike those kind of gimmicky boring add-ons they put in games to take up time. Rated 2 out of 5 by scamp69 from Tragic disappointment, I so wanted this to be good. The characters, both speech and movement were so awful it was painful to finish the demo. The blue aura gizmo was stupid. The fingerprint gizmo - another failure. The best I can say is the map was excellent. Try before you buy. I wanted a real murder mystery - NOT this thing. Rated 2 out of 5 by riverdiver from No great song sung by this bard Based on trial Murder Mysteries are among my favourite games. I love Whodunits, so I accepted the invite to Maybard Estate. Having played quite a few games it was no surprise to find the door of the Estate closed. Still very motivated I took up a struggle with a bull dog to get the ring for the door knocker. That bit was quite fun. New twist! The dog didn’t want food but a toy!!! I made my way into the Estate, was greeted by a British butler and the sister of the murdered „Lord of the Estate“. She made me look for the spare key as the butler’s key had broken when he wanted to open the living room. Here I didn’t use my supernatural abilities and found the spare key in a quite average HOPA manner. Finally the other ladies (the daughter and a „friend of the family“?, poorest voice overs I’ve heard for a long, long time) and the lawyer turn up for the reading of the will of the deceased. One woman collapses, even though I’ve found a fan for her relieve. But it wasn’t the fan that caused her distress, it must have been the water. Seconds later the doctor is there, only to find out he’s missing some of his equipment. Of course, me, the detective is going to look for it. The doctor and the lawyer are at least surveying the poor lady. The missing instruments didn’t save her life though. Ok, second victim, more trouble. Now the lawyer wants my help: he urgently needs documents from the safe of the first victim. This room is sealed off, the lawyer still knows how to get there, but he doesn’t go there himself, he asks me. So I climb up to the roof. First I interact with a bird guarding a useful item and this animal seems partial to food. Of course I find the seeds just a bit later. My motivation declined from scene to scene. Hardly any challenge. The supernatural ability to use a monocle on scenes didn’t appeal to me, I found it tedious. HO’s in a format copied from another dev. Grinding music on a very short loop, hardly any variation. A ghost popping up, you don’t know who he is, what he wants. Most probably it will be explained later, but I won’t be there to find out. I left Maybard Estate after the trial and I will never ever go back there. Happy Gaming to those who like it! Rated 1 out of 5 by ElaineNola from WAY too easy I have to admit, I bought this game based on the reviews without playing the demo. I also bought the other games that were packaged with it the same way. This game is WAY too easy. I am hoping the others are not. Unless you are a total newbie, stay away. 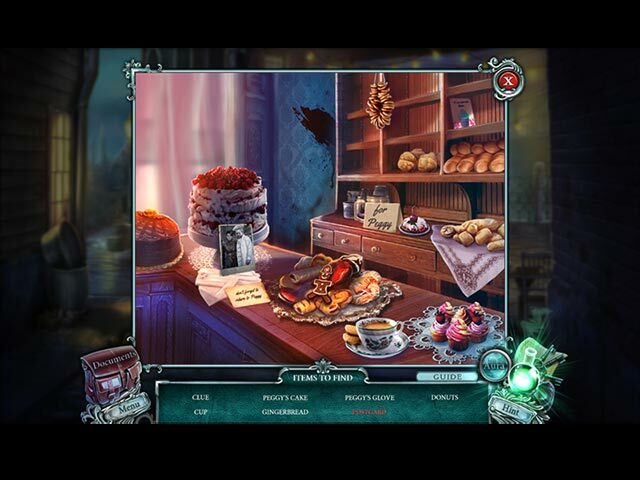 Even the hidden objects are a piece of cake. Rated 1 out of 5 by Daxadillion from UNBELIEVABLY BORING What an appalling game! I did actually fall asleep until one of my cats jumped onto my lap. I really can't say anything good about it except that I would have loved to cuddle the little chubby dog. Ghastly music which was also boring as well as annoying. I thought murder mysteries had more dramatic music than this. Surprisingly I skipped the puzzles as I usually love them. The mini games were so easy they were an insult even to an amoeba. Wooden voices with a range of awful accents, except for the butler as his English was well pronounced. Story line - well there wasn't really one, all you have to do is run around for anything and everything the characters demand. You are even expected to climb a tree to the top of the building wearing a full length 19th century dress AND on the way up you have to do a mini game too, which is in 4 parts! Sadly my 'supernatural abilities' abandoned me today, if they hadn't I would never have demoed this game. This game is definitely not CE worthy in my opinion. The head of the Maybard family has been murdered!